Each store offers a wide variety of wines for every occasion and budget. There is an extensive foreign and domestic wine selection at all Bales & Lamb's locations. 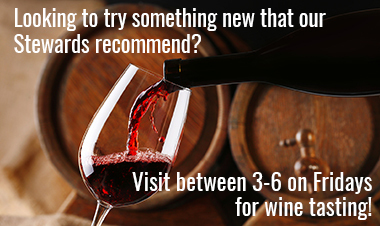 Visit any of our stores and chat with our friendly and highly knowledgeable Wine Stewards! Let them help you select just the right wine to complement your meal or enjoy at your next party, they are sure to find you the perfect pairing for any occasion. * Wine Tasting Schedules Vary by Location. Times are subject to change.